Human nature has remained pretty much the same since we were hanging out in caves. What keeps changing are the tools we use to explore and communicate. It has been a long, strange trip from the ox cart to the rocket ship, but in fact, we ain't seen nothing yet. Now. internet technology is allowing people in modern and developing nations to form new neighborhoods, defined not by physical boundaries, but by common interests. Huge communities are forming at MySpace, YouTube, Bebo, Second Life, Flickr, FaceBook, Skype, and in the blogosphere. These online communities, in themselves, are as overwhelming, complex and perhaps as dangerous as any large city. If it were tangible, YouTube would have five time more daily visitors than Sao Paolo, the world’s largest. But visitors don’t dwell in chaos withy the 100 million other visitors. Instead they find and are discovered by people with whom they share common interests. In fact, inside YouTube, you’ll find lovers of unknown rock groups. They never notice that elsewhere in the community may be film clips intended to recruit young terrorists. Essential to the overwhelming success of these online communities is that people find neighborhoods that appeal to them and ignore the ones that don’t—just like in the tangible world. They share spaces in each community with others who share their passion for anything from bird watching to bomb making. These are neighborhoods where geography is becoming irrelevant. It is very much like in the real world, where the neighborhood on one side of the street is very different than one across the other. Most people are comfortable in their own neighborhoods, because they know the rules, culture and language local jargon and innuendos. We know the best shortcuts and what areas to avoid. When we need a recommendation, we ask a neighbor. We trust local experts. This behavior is now moving to the internet, where people do not have to be physically present to live in a community, or for that matter, be recognized as a leader in it. Each of us can now live in several neighborhoods, simultaneously, where our neighbors are people from anywhere, with whom we share that particular interest. These are global neighborhoods. They may not be tangible, but they are far from virtual. Real people separated by miles, oceans and political borders are connecting with others of like mind. They are conducting a great deal of business, making decisions based on the influence of peers rather than marketing campaigns. In a few cases, friendships are being formed between people whose governments are waging hostilities. Even the profound barrier of diverse language is being lowered by the universal communications abilities of music and pictures. While human nature may be staying the same, there is incredible change occurring at the cross hairs of technology and culture. People’s worlds are getting bigger. Historically, when we ventured out of our neighborhoods on brief journeys for recreation, business or learning, we might have returned home with some sliver of a foreign culture--a picture, a garment or perhaps some music. But now we are engaging with people in far off lands, being exposed to a multitude of cultural subtleties. People all over the world are seeing our cultural differences even as they realize how very much alike we all are. • A young Belgian woman goes to Israel to study photography. She has friends in both the Palestinian and Israeli sectors of Jerusalem and after a while, she persuades them to talk directly to each other. They are both surprised to find they have many similarities. She determines that what worked for two friends may work for many other people as well. She brings her idea to a international teaching group and they create a private online community comprised of Palestinian and Israeli high schoolers who learn how much they share in common. Eventually to two classrooms meet, discovering how much they like each other and offering a glimmer of hope that maybe programs like this can diminish hostilities that have been going on for far too long. • A Scottish 16-year-old girl whose parents rarely traveled beyond their own neighborhood gets accepted into an advanced language studies c class. As a project, she produces and hosts a video podcast of the Dating Game—except that it’s in the Japanese language. It is well received 10,000 miles away in Japan. Now she talks regularly online with Chinese and Japanese friends and has been invited to go to Japan. She’s even had to decline a marriage proposal. • A Scottish couple uses Second Life’s virtual reality program to engage Brooklyn ghetto kids with affluent Dutch suburban kids for a single summer. The result is both sets do better in school, the ghetto kids remarkably so. A significant portion of them decide not to drop out of school. Grades go up. Career plans show higher ambitions. Global Neighborhoods also examines the likely outcomes to the workplace of a generation that gets its information and places its trust on peers rather than institutions. It asks what happens when they enter the mainstream marketplaces as customers, employees and potential competitors. It examines how businesses will need to adjust course to gain credibility with a generation that has cultivated a Teflon resistance to traditional marketing techniques. A case in point on how this is achieved is illustrated at Hitachi, one of the 100 largest companies on earth, which entrusted a 31-year-old mid-level employee to use social media to bolster its worldwide Data Systems division. He created a wiki that invited not just customers, but even competing vendors to join and contribute. The result being primarily that the user, not the vendor, gains power, but Hitachi becomes the perceived category leader for its contributions. The book also explains why politicians and government officials are stampeding into the social media in pursuit of voters and the people who most influence them. It catches David Cameron who hopes to replace Tony Blair as British prime minister squatting on an Edinburgh sidewalk, chatting with a homeless person for the benefit of his campaign video blog camera. 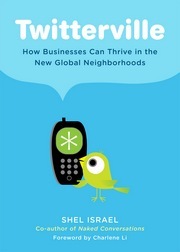 It examines the blog of Anthony Williams, mayor of Washington DC whose popularity has soared since he started blogging. It reports on why two Italian cabinet ministers are blogging even though their country has only 30 percent broadband adoption today. In exclusive interviews with the president and former prime minister of tiny Estonia, the author reports on why these national leaders say over 90 percent of voters under age 25, voted in the most recent election—entirely online and why the Internet makes their nation the world’s most direct democracy. The book also dedicates a chapter to the darker side of the social media explosion, examining the multitude of spammers, sploggers and assorted scammers. It looks also at the more serious aspects of blogs by skinheads, recruiting films by al Qaeda and the president of Iran who is using a blog to establish himself as the world leader in anti Zionism. Global Neighborhoods also examines the shortcoming of these new geographically agnostic relationships. It argues that all this online touching and talking still falls short of a face- to-face meeting or direct interactive conversation. But it sees the solution in the disruptive explosion of very low cost telephony services. Likewise, low-cost airlines are making it easier for more people to travel further and more often than ever before. The author concludes that despite the significant troubles of the world today, and the numerous threats to a free internet, despite the fact that the powerful tools of the internet are available to bad guys as well as good, there is great hope in the new tomorrow through the decentralization of influence via the internet. The author recollects that when asked why the US wanted to recognize China, Henry Kissinger observed that countries that do business with each other are unlikely to go to war against each other. Global Neighborhoods extends the argument, contending that like the Palestinian and Israeli students, people, who get to know each other, and understand each other’s cultures, are unlikely to want to wage hostilities. This book fits into three bookseller categories: Business, General Interest and Current Affairs very much like recent best-sellers such as The World is Flat, The Wisdom of Crowds, Freakonomics and Blink. It also will appeal to any parents curious to see what the world may look like as their children come of age.